Deepti has done it again. but she also has an easy to follow tutorial for you! Step 4 - Mask the edges with post it notes and ink creating a gradient from dark to light. Step 6 - Adhere the top panel on the card base adding some foam dots. Then add the flowers and some sequins to finish the card. I love how she tucked one flower under the panel and popped one on the outside. Did you hear that Deepti has a brand new class that just opened at Craftsy?? Such drama and beauty in one little space, Deepti! So gorgeous!!! AWESOME card Deepti ! Thanks for the tut ! Such a beautiful card! 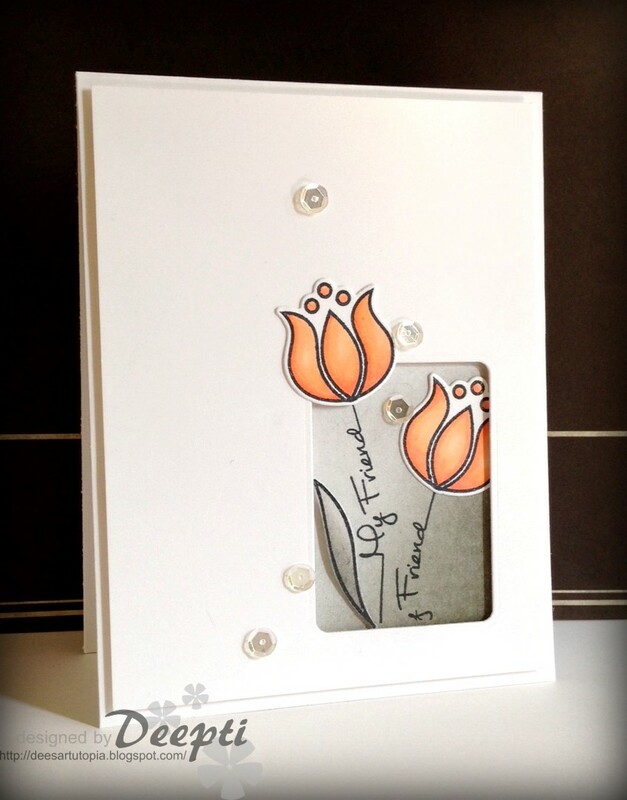 I love how Deepti blended her inks on the blooms and how she used the sentiments for her stems...very clever! This is amazing and so well done!!! Thanks, Deepti - SO MUCH for showing the pics of how to make this lovely creation!! Thud! This is too gorgeous, Deepti! Deepti, this is such a fantastic design and love the colour of those beautiful flowers.